Please join us from 10:00 AM to 2:00 PM today for Open Gym Saturday. There will be TWO formal group workouts today. The first workout will start at 10:00 AM and will be open to all skill levels and is free to our community. The second session will be our new Competitors Class workout and will begin at approximately 11:30 AM. This workout will be programmed at the Advanced level. Please be sure to review the Advanced Athlete and Intermediate Athlete expectations. The Advanced Workout is only for members of CrossFit Amundson and will be Coached by Greg Amundson. Open gym will be from 12:30 PM to 2:00 PM with supervision from our Coaching Team. This is a great opportunity to work on skills and the accomplishment of your goals. Beginning next week, our new Olympic LIfting Program will be offered on Tuesday at 7:00 PM, Wednesday and Friday at 11:00 AM and Sunday at 10:00 AM. 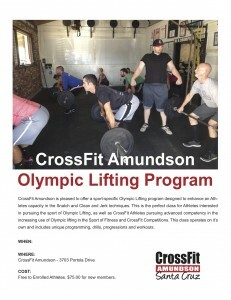 This class is free for all CrossFit Amundson Athletes. New Athletes joining our gym may enroll solely into the Olympic Lifting Class for $75.00 a month. E-mail Info@CrossFitAmundson.com for more information and to register. This is my last workout before the fight for my life. If I win here, I can win anywhere. Are you training with that level of commitment? Train hard today my friend. Train as if your life depends on it.